Considering a day trip or weekend getaway later this month? What about a fun-filled festival with luxurious wines and spirits, quality beer, food from highly rated restaurants, celebrity chefs, and lots of entertainment in a beautiful and exciting New England destination? The Mohegan Sun recently reached out to me about the Sun Winefest, a three-day event from Friday, January 27th to Sunday, January 29th. They have also offered a giveaway to hopefully excite LookyTasty readers to make a trip to Mohegan Sun. One of the main events is the Sun WineFest Grand Tasting, where there will be over 1,000 brands of beer, wine, and specialty spirits to choose from, along with tastings of specialty sponsor spirits and delectable dishes as well. On the Main Culinary Stage, there’s also going to be celebrity chef demonstrations and presentations for your entertainment – like Food Network stars Bobby Flay, Iron Chef Marc Forgione, Donatella Arpaia and Robert Irvine. 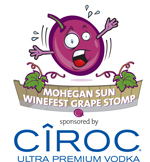 There’s also going to be contests, such as the Mohegan Sun WineFest Grape Stomp presented by Ciroc Ultra Premium Vodka and Oyster Open presented by Bud Light Lime. The one-day pass for Sunday, Jan 29th is still available! Tickets are $70. The tasting runs from 12pm to 5pm at the Convention Center. Another event is Bubbles & Bon Bons on Sunday, January 29th. This event, presented by Perrier-Jouët, brings you champagne and sweet, sweet desserts – featuring Jacque Torres, one of the most highly regarded pastry chefs and chocolatiers in the world. Jacques will be joined by Emily Luchetti, recognized around the world for her award-winning sweet creations and the author of five cookbooks, Daisy Martinez host of Viva Daisy on the Food Network and Executive Pastry Chef Lynn Mansel from Mohegan Sun. Indulge in tasty desserts and while popping champagne, now how great does that sound? Tickets are $95. This event runs from 6pm to 9pm at the The Cabaret Theatre and concludes the Sun Winefest weekend. If they both interest you, they have a special package for $135 giving you access to both events on Sunday. Mohegan Sun is located at 1 Mohegan Sun Boulevard in Uncasville, Connecticut. Here’s some information on how to get there and a list of places to stay in the area if you choose to spend the night. Yum…champagne & bon bons…a complete party!